Munters stand-alone heat exchangers function independently of other equipment, allowing you to realize cost savings from waste gas streams. The models include plate, wheel, and heat pipe heat exchangers for lower temperature commercial applications as well as welded plate and welded tubular heat exchangers for higher temperature industrial applications. 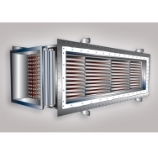 The following are the heat exchanger product descriptions. Thermo-T™: The Thermo-T tubular heat-exchanger is designed to recover heat from energy-consuming processes up to 2000°F. Energy can be recovered and returned as process make-up air, used to preheat combustion air, or used for plant or office heating. Thermo-Z™: The Thermo-Z plate-style heat-exchanger is designed to recover heat from energy consuming processes up to 1500°F. Energy can be recovered and returned as process make-up air, used to preheat combustion air, or used for plant or office heating. Z-Duct™: Whether packaged in a unit or applied as a stand-alone plate heat exchanger, the Z-Duct will reduce cooling requirements in the summer and heating requirements in the winter. Munters offers the most versatile line of energy recovery products. 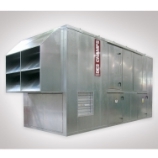 Exhaust recovery ventilation utilizes energy from the exhaust air stream to precondition the outside air being introduced into the building. In the winter it provides free heating and in the summer free cooling. 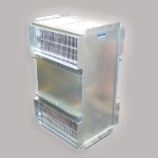 Munters can also offer their air-to-air heat exchangers as a packaged system.